The apex court asks petitioner to move Madras High Court. In the light of growing defiance of its directions on jallikattu in Tamil Nadu, the Supreme Court on Thursday refused to give an urgent hearing to a related plea in the public interest. A bench comprising Chief Justice of India JS Khehar and Justice DY Chandrachud, however, asked the petitioner to approach the Madras High Court. In the plea, advocate N Raja Ramana had sought the court's intervention, citing Wednesday's mass protest at Marina Beach in Chennai. The court should take suo motu cognisance and issue appropriate directions to the state government, it appealed. The apex court, however, asked the lawyer to file appropriate plea in the Madras High Court for relief. When Ramana informed the court that he had approached the high court, which refused to hear saying the apex court is seized of with the matter, the bench asked him to file a formal petition. Ramana argued that the public were staging a peaceful protest at Marina Beach, but the police were not allowing the protesters to take even food and water. So, the court should take suo motu cognizance of the matter and hear it, he said. Another bench led by Justice Dipak Misra has already reserved its order on a petition that challenged the Central government’s notification on jallikattu. 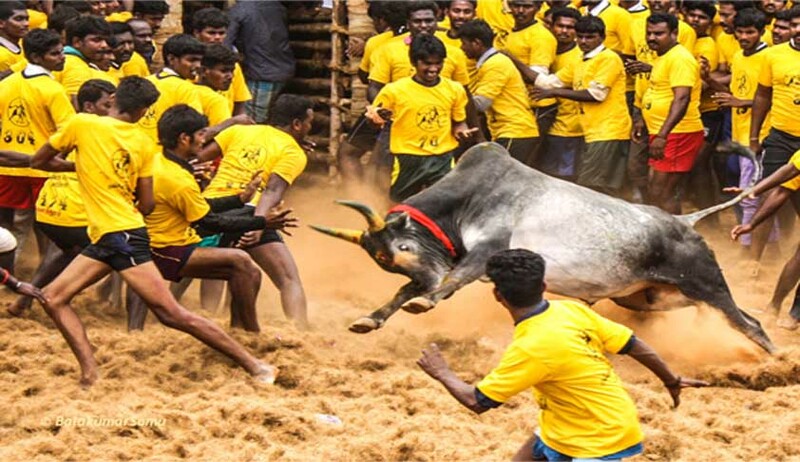 The court in its 2014 judgment had said that bulls cannot be used as performing animals, either for Jallikattu events or bullock-cart races in the states of Tamil Nadu, Maharashtra or elsewhere in the country, and had banned their use for such events all across the nation.